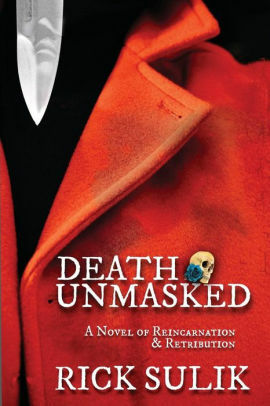 Disclosure: Almost three months ago, author Rick Sulik asked me to review his 2015 novel Death Unmasked. We had an email discussion and I agreed with the understanding that I would provide an honest review, no holds barred. I subsequently received a kindle edition of the book and finished reading it yesterday. You should probably know two things about Rick before we get started. He’s a retired police officer, having served on both the Houston and Pasadena (Texas) police forces. He believes in reincarnation. Both of these figure prominently in this novel. Imagine that you’re a homicide detective in Houston and nearing retirement. You’re a loner, both on the force and in your personal life, and yet there is this longing in you for connection. Then, little by little, you begin to recall experiences from a past life, your previous name, your wife, how you died, and how she was raped and murdered. As the story progresses, we find that Detective Sean Jamison is on a collision course with the reincarnated souls of his former wife and the man who murdered them both, but with a twist. The murderer has been reincarnated as a notorious serial killer of women in and around Huston, and the reincarnated soul of Sean’s wife is the murderer’s next target. I imagine that got your attention. It sure got mine. Sulik’s experiences as a police officer lend realism to those portions of the story, which adds to the tension of the chase, but while the reincarnation parts of the tale begin subtly, as the narrative progresses, it’s as if memories, and even scars and injuries experienced in past lives, readily become available to the present person’s consciousness, almost too easily. Sean displays what amounts to a supernatural awareness, not only of many people’s past lives, but of when, where, and how certain crimes will occur next. It was a little difficult for me to grasp, ceasing to be a murder mystery with reincarnation overtones, and becoming a full-blown paranormal thriller. That’s what I didn’t expect. I generally liked the characters (except the murderer, of course), but many times the dialog seemed a bit stilted or awkward, and the dynamic tension seemed a little uneven, although not enough to keep me from continuing to turn pages. I won’t spoil the ending for you, but it seemed like the story went on a little bit too long after the climax. I realize there were loose ends to tie up, but at least some of those loose ends could have been trimmed down. “Death Unmasked” is a unique thriller with a gritty feel, and the author brought a lot to the table with his personal and professional experiences, but the characterization, dialog, and plot could have benefited from being a bit tighter. All that said, I recommend the novel and it’s a solid “four star” review on Amazon.